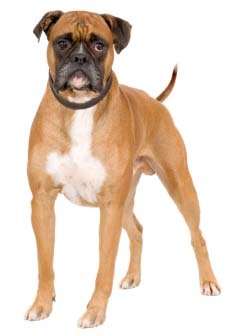 Learn about the temperament and personality of the Boxer. Discover what he's like to live with, his traits and characteristics and how he generally behaves. And look at lots of Boxer photos. The Boxer is alert, curious, playful, loyal and dignified. He's self-confident, courageous, strong and athletic. He's a very social dog and loves people. He's craves your affection and physical contact. He thrives on pats, hugs, scratches and belly rubs. He loves to sit on your lap! He loves to be with you at all times; he will become your shadow. He is the kind of dog who is always in your face. He's a playful clown. He adores children and is very patient with them and loves to play with them! However because of his boisterous nature he could unintentionally knock-over a small child. He's lively and active around the home, constantly on the move. If he isn't getting enough exercise or becomes bored he'll find mischievous ways to occupy himself: usually chewing anything in sight. He's wary and standoffish with strangers until he warms up to them. He's an instinctive guard dog, protective of his family and will not back down if threatened. He drools and slobbers quite a lot, especially after drinking. And he sometimes has flatulence which can be quite smelly. He is not a dog who can live outside. The Boxer sheds a fair amount of hair. You'll find hair stuck to your couch, carpets, clothes and everything else in your home.